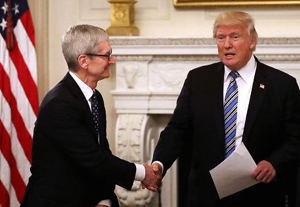 The Orange Dork has nothing to do with the Success of the Apple Inc. This tax cut stinks. Last time it was down to 10% and now only to 15.5%. The Orange Dork could not even deliver with that. Now Apple has to pay 55% more tax. BTW USA is the ONLY country in the world with this type of tax. So the Orange Staple Genius could have deleted the whole tax like the rest of the world has done. The innocent Iraqis that Apple’s home country has murdered (and continue to murder) by near genocidal numbers and those you’ve labeled as enemy combatants might disagree with you. Those that are still alive of course. Torture is for terrorists. If you don’t understand that, it is you who are clueless. Peace is the default mode for the planet, it’s only at the advent of man, a relatively new species on the planet that war has taken such a grandiose spectacle, and I’m not that clueless to know which nation(s) spends massive amounts on their military and those that have a history of being at war. The planet has enjoyed millions of years of peace, it’s the default mode of the planet. Clueless? When was the last year Apple’s home nation was at peace? When was the first year since 1776 that Apple’s home nation was at peace? Apple’s home nation is from it’s inception been a war mongering nation, fortunately and quite often on the side of yes freedom and humanity. Now it is a torturing terrorist nation with no regards for the sovereignty of others as demonstrated by your escapade into Iraq. The facts are there. Sure you are not alone, but your nation is now leaning with those other bad world actors. I’m not denying the greatness that nation once demonstrated, and I’m hopeful that one day it will remove itself from Iraq invasion. toss torture to the way side, and rejoin the ranks of the free and civilized world. Still can’t answer five easy questions? Still totally deflecting posts and not addressing them at all. Still pushing your mindless meme to exclusion of all rebuttals. Trump left out a few things: highest corruption and least computing competence of any recent administration for starters. Bravo Mueller!